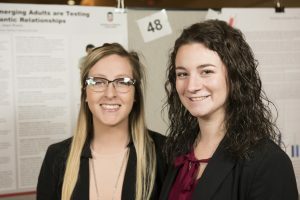 Taylor Lupo, right, and Kelli Kohlstedt present their work during URAD here at NIU. An undergraduate research team led by Scott Sibley, assistant professor of family and child studies who researches commitment in couple relationships and romantic relationship formation, has been very successful this semester. The team of 13 students presented a research project at the Illinois Council of Family Relations 2017 conference at Illinois State University in April. Some of the students presented their posters during the Undergraduate Research and Artistry Day (URAD).